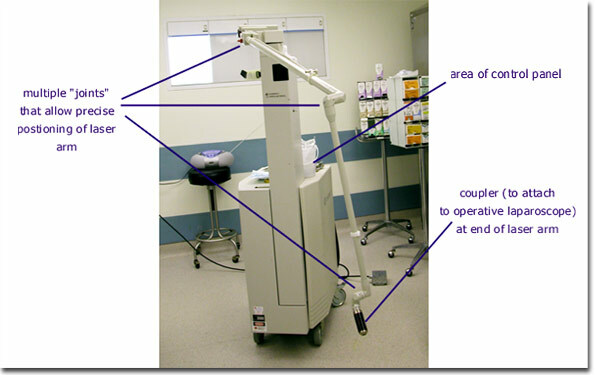 Surgical lasers vary somewhat in size but generally are relatively large instruments (with wheels for mobility). This laser (in the photo) is an “ultrapulse” laser that is manufactured by Coherent. The ultrapulse power settings that are unique to this laser are outstanding for infertility work since they result in very little heating of tissue surrounding the target (vaporized) tissue. Each laser has a control panel (not seen in this photo) where power settings are selected. The laser arm has several “joints” where the arm can be bent to allow for precise positioning of the arm. There are mirrors within these joints that reflect the laser beam through the arm. A coupler can be placed at the distal end of the laser arm to couple the laser to an operative laparoscope. When coupled to an operative laparoscope the laser beam is transmitted through the laser channel of the laparoscope to the target tissue.